Kia mutes the cute with the 2020 Soul redesign, going with a darker, even angrier look with the familiar but modernized styling. It’s plopped onto a new platform, with new standard and electric powertrains, and arrives in the spring of 2019 in LX, X-Line, S, EX, EX Designer Collection, EV, EV Designer Collection, and GT-Line trim levels. Slim-design headlights, a downturned oversized grille, and still cartoonish dimensions and detailing give the 2020 Kia Soul a Pixarish appearance, and I mean that in the best way possible. The Soul has always exuded personality, and that’s true in the third-generation version that debuted at the 2018 Los Angeles Auto Show. New roof-rack mounting points add utility, and the 2020 Soul sits on a wheelbase stretched 1.2 inches and is 2.2 inches longer than it used to be. Width and height are unchanged, according to Kia. A new X-Line trim debuts for 2020. Based on LX trim, it adds a more rugged exterior appearance with body cladding, overfender trim, off-road-inspired accents, fog lights, unique 18-inch wheels, and available 2-tone paint. Still, without an optional all-wheel-drive system, the Soul isn’t a crossover SUV. It remains a multi-purpose vehicle. The EX Designer Collection aims to add a sense of occasion to the Soul. It is based on the EX trim and installs LED headlights, fog lights, a 2-tone roof treatment, and 18-inch wheels with black spokes and 235/45 tires. GT-Line trim is also new, offered with both the standard 4-cylinder engine and the optional turbocharged engine. Both include Sport-design bumpers with red accents up front, fog lights, side sill trim, 18-inch aluminum wheels with 235/45 tires, and gloss-black side mirrors. Turbocharged versions are identifiable by their center-mounted exhaust outlet. The Soul EV is equipped with a body-color insert where the grille would normally be, with a charging port door offset to the right of center. A cross-car LED light bar distinguishes the Soul EV, along with unique lightweight 17-inch wheels and slightly different rear styling. Upgrade to the EV Designer Collection and the Soul has 2-tone paint, gloss black heated and power folding side mirrors with turn signal indicators. Passenger space is mostly unchanged compared to the previous Soul, with slight reductions in front headroom and rear legroom. The 2020 Soul’s front door openings are larger than before, which could make it even easier to get into and out of this relatively high-riding car. Cloth seats are standard for all trims except the GT-Line Turbo (technically called the GT-Line 1.6T), which has combination leather and cloth upholstery. This upgrade is an option for EX and EX Designer Series versions of the new Soul. The EV Designer Series has a non-animal Sofino premium upholstery. All Souls have a 6-way adjustable driver’s seat with a manual height adjuster. Upgrades for top trims include a 10-way power adjustable driver’s seat, an 8-way power adjustable front passenger’s seat, and heated front seats. GT-Line trim also features a leather-wrapped flat-bottom steering wheel, which is heated when you choose the Turbo. Kia says the 2020 Soul’s interior design revolves around the “emotional visualization of sound.” As such, acoustic-inspired shapes and textures give the cabin some (what else?) personality, and the car’s signature tweeter speakers make the cut. Cargo capacity increases by 5 cu.-ft. over the previous Soul, a significant benefit giving the Soul 23.8 cu.-ft. of space behind the rear seat. Plus, the cargo opening is wider and lower than before, and an available dual-level cargo board helps to maximize use of the space. An easy-grip handle is located on the inside of the hatch, allowing you to slam it shut without touching the exterior paint. 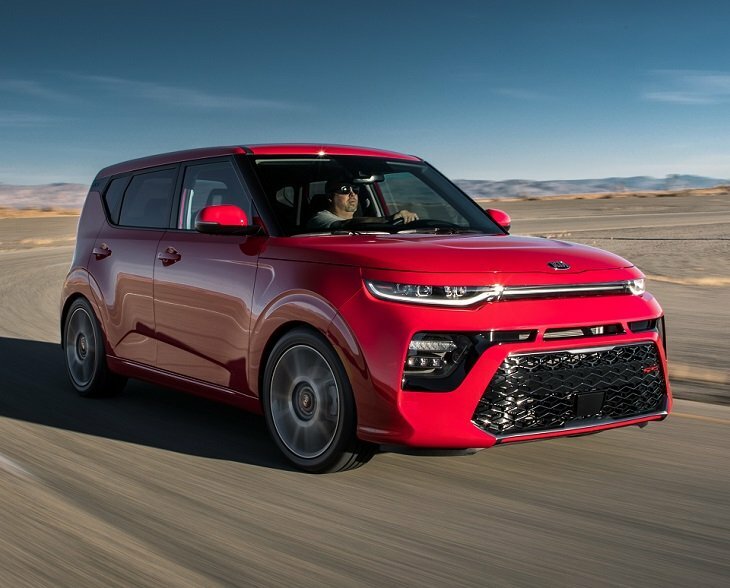 The 2020 Kia Soul’s standard engine is a 2.0-liter 4-cylinder making 147 horsepower and 132 lb.-ft. of torque. A 6-speed manual gearbox is standard (LX only), with a continuously variable transmission (CVT) included for most trims. An Idle Stop/Go automatic engine start/stop system is also standard for all but LX trim. A turbocharged engine continues from the previous Soul, a 1.6-liter 4-cylinder offered only as an option for GT-Line trim. It’s good for 201 hp and 195 lb.-ft. of torque, and a 7-speed dual-clutch transmission (DCT) is standard with this engine. The Soul GT-Line Turbo also has larger brakes and a sport-tuned suspension. Speaking of the suspension, Kia has reworked it to reduce noise, vibration, and harshness (NVH), and also to improve handling and ride comfort. MacPherson struts handle the damping duties up front, while a coupled torsion beam axle is bolted into place in back. Kia pitches the Soul as a crossover SUV, and with 6.7 inches of ground clearance it can travel tougher terrain than a typical car. However, and inexplicably, there still is no all-wheel-drive option for this vehicle. Switching gears, so to speak, the electric Soul EV returns for 2020 with 201 hp and 291 lb.-ft. of torque (up 81 lb.-ft. from the previous Soul EV). A 64 kWh liquid-cooled lithium-ion battery with standard DC fast-charging capability zaps the electric motor, delivering 60 mph in about 7.5 seconds by Kia’s stopwatch. Top speed is 104 mph. Kia says it will take 59 hours to fully recharge the car using a standard household electrical outlet. Upgrade to a 240-volt Level 2 home charging station, and a full battery requires about 9.5 hours of charging time. The Soul EV includes standard DC fast charging capability, which provides an 80-percent battery charge in as little as 60 minutes. The Soul EV gets a unique rotary shifter and center console layout, and drivers can choose between Eco, Comfort, Sport, and Eco+ driving modes, Four different levels of braking regeneration are available, too, activated using the paddle on the steering wheel. The most aggressive setting can even bring the car to a full stop. Ground clearance is not as generous in the Soul EV, measuring six inches. This version of the car does, however, have a more sophisticated multi-link rear suspension design. Kia says it has increased the use of advanced high-strength steel in the Soul’s underlying architecture, and expects the redesigned car to deliver top crash-test ratings. As far as driver assistance and collision avoidance systems are concerned, you’ll need to get into the Soul X-Line for a blind spot monitoring system with lane change assist, and a rear cross-traffic alert system. Soul S trim adds forward collision warning with automatic emergency braking, a driver attention monitor, and lane departure warning with lane keeping assist systems. Adaptive cruise control and a more sophisticated pedestrian detection system are offered only for the GT-Line Turbo. The Soul EV has a unique pedestrian warning system designed to let people know an electric car is operating nearby. As standard equipment, Soul LX, X-Line, S, and GT-Line have an infotainment system with a 7-inch display, Apple CarPlay and Android Auto, and Bluetooth connectivity. Upgrade to EX, EX Designer Series, GT-Line Turbo, or the Soul EV and you’ll get an infotainment system with a 10.25-inch display with split-screen functionality, HD Radio, satellite radio, a navigation system, and more sophisticated voice recognition. In the Soul EV, new UVO functions better inform the owner about that car’s specific drivetrain. Wireless device charging is available for the new 2020 Soul. The GT-Line Turbos also get a 10-speaker, 640-watt Harman Kardon premium sound system (available in Soul EV), an 8-inch head-up display, and premium Supervision instrumentation.